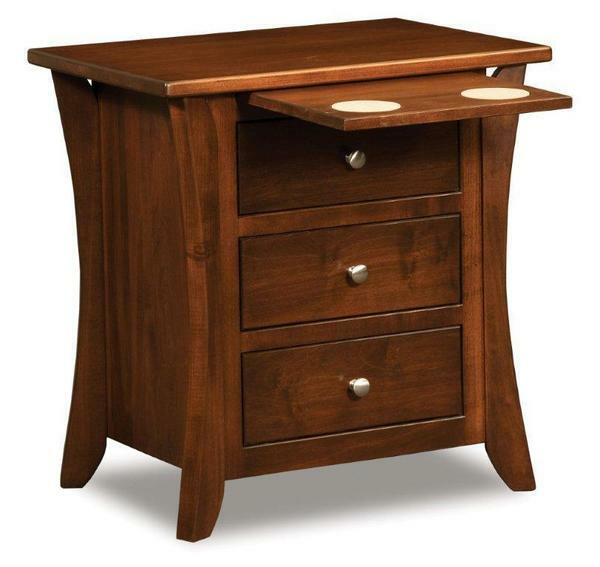 Choose to add the Thirsty Stone Pullout Tray as shown in the photo to this Shaker Contemporary Night Stand. Customers love the Thirsty Stone Pullout Tray because it is the perfect place to set your water in the evening. This beautiful Shaker night stand is shown in brown maple wood with a coffee stain. Please call to receive finish samples in the mail for this Caledonia night stand. We also offer the Amish Caledonia Night Stand with Two Doors. My bedroom furniture is so beautiful and with 4 children it is nice to have a beautiful place to escape to at the end of the day. I not only sell our products but I own them too. This helps me to be a firm believer in the quality and beauty of our furniture.